Garden design should always be done to scale by a professional with a sound understanding of geometry and experience in hardscape plans. This is because so many plantings are installed around horizontal surfaces areas such as patios and pools, and because vegetation in general seems to go hand in hand with the decorative aspects of custom fountains and outdoor buildings. A good working knowledge of plant science helps as well—although a formal degree in botany is not required. What is required is an understanding on the part of the residential landscaper that true garden design calls for a great deal more than colorful flowers to add experience and value to Houston outdoor living. This is due to the simple fact that, without exception, greenery is the foundational color to every style of garden design. A professionally installed planting will feature multiple shades of green arranged in layers. This prevents the form from looking flat and two dimensional and helps it stand out more prominently on the landscape proper. A number of plant species are used to create this range of green hue, including hedges, special grasses, ground cover plants, and even small trees. Once a foundation of varied greenery is laid, color is then introduced in two ways. Annual color is established with certain ground species with colored leaves. 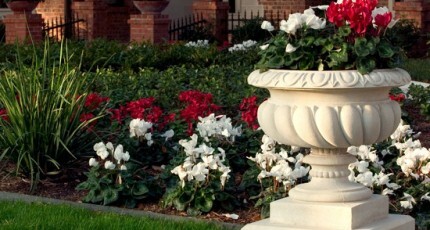 Plants such as begonias, impatiens, salvias, pansies, petunias, and cyclamen add depth and variety when intermingled with grasses, shrubs, and clipped hedges. Next, seasonal colors are introduced through flowering plants. 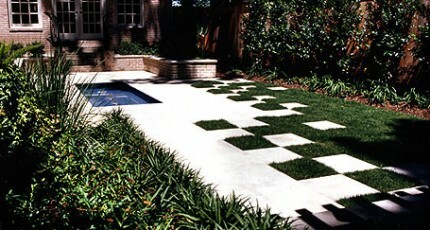 White is something of a foundational color that is common to all garden design styles. The amount of white present depends on the style chosen, as does the degree to which other colors are added as well. The style of the garden, as well as its size, determines its location in the yard. Larger plantings almost always occupy a centrist position either in the middle of the yard or in the middle of an entire quadrant of the yard. Such styles include traditional parterre gardens (though not necessarily their derivatives), French gardens, Japanese water gardens, and English gardens. Other garden designs work better as linear support elements. We install them alongside of homes, architectural walls, fences, and custom walkways. Italian and Mediterranean styles are two of the more popular types that typically adorn the exteriors of homes. Contemporary and modern gardens are also used extensively to add a touch of the organic to residential architecture, although these types also can be used anywhere in a contemporary landscape or courtyard due to the highly eclectic and abstract nature of modern landscaping design. Still other garden designs are deliberately removed from the surrounding landscape in order to create the feeling of a separate realm of experience. This is often done for residents who entertain a great deal at home, but who also want to create their own private space just for themselves as a couple. These areas are typically dedicated to reading, meditation, or quiet conversation in a quiet corner of the yard. Zen gardens and water gardens are very popular in these places because they contribute to the sense of Being that residents are looking to experience when they go to their own special place in the back yard. Other areas where gardens may be liberally planted at will include outdoor rooms, hide spaces, tree houses, and garden overlooks that are separate from the home. Many of these garden designs are not based on any particular cultural theme or aesthetic form, but are rather the custom creation of the landscape designer. Again, this is where a good working knowledge of geometry comes into play. Custom gardens around places like private patios and morning fountains are based on correlative forms that work to extrapolate architectural keynotes into open space, transforming them into organic sense in the process. The choice of a specific garden design is always based on relationship. When we say relationship we mean reflection and counterpoint to corresponding landscape elements whose significance and size constitute the essence of the landscaping theme. The home is the most preeminent of these, occupying a central position on the property and functioning as an emblematic symbol of lifestyle and resident character. Trees are also very important elements to factor into a landscape master plan because they literally form the pillars of the landscape. Gardens planted in proper relationship to trees help balance the vertical and horizontal perspectives of the yard and create an aesthetic of multidimensional organic vibrancy. Whenever water features of any kind are developed on a property, garden design should also intentionally compliment them. Swimming pools, natural ponds, ornamental waterfalls, and custom water fountains all benefit tremendously by the addition of a garden to their outlying boundaries. After all, water and vegetation occur side by side in virtually every environment in the world. Cultivating an innately natural relationship with deliberate planning and design techniques helps magnify the presence of life and vitality that Exterior Worlds works to create for each and every client. 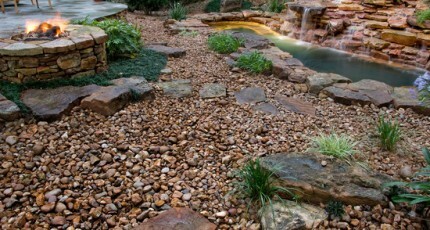 In addition to magnifying the living elements of the landscape, vegetation and flowers help magnify hardscapes as well. Hardscapes can cover up to 70 percent of the surface area in a yard, so they represent a grouping of elements that demand attention for the sake of aesthetic magnification. Most hardscapes are either stone or concrete and basically horizontal in form. However, iron and wood structures—such as trellises, arbors, and fences—are also technically classified as arbors. Vegetation is needed around each of these forms in order to create a sense of unity between the natural and the manmade. In the case of wood and stone, vegetation is also reminiscent of corresponding relationships between plants, rocks, and trees in the natural world. In the case of concrete and iron work, vegetation softens the appearance of what may otherwise look like a harsh protuberance in an otherwise pristine scene. Additionally, some hardscapes like walkways and driveways can even be given a sense of movement by garden design. Plantings along the sides of these surfaces can be used to signify traffic patterns for both pedestrians and vehicles. This is particularly beneficial along any surface traveled at night, where landscape lighting illuminates garden elements as living signposts pointing the way to the many points of interest found throughout the landscape. There is also an unseen, but equally important, aspect to garden design, and that is irrigation and drainage. Although Houston enjoys a very humid climate, rains are very sporadic and not to be depended on for the watering of plants. A professionally designed and automated irrigation system has to be built in the yard in order to ensure the viability of organic forms. This system must be both workable and concealed, because the visible presence of pipes and sprinklers will quickly diminish the aesthetic. A concealed drainage system is also needed to remove the excess water produced by irrigation pipes, and to protect the yard from flooding during those times when it does rain. Although Houston has a very effective storm sewer system that does a good job of draining flood waters remarkably quickly (considering our near-sea level elevation and absolutely flat terrain), getting the water out of the garden and into the storm sewer to begin with is another matter. Again, only professionals trained in advanced landscape architecture methods can create such a system without giving away its presence to the naked eye. Why use Drought Resistant Perennials?